This week, Mother Nature gave us a nice break as for the Albatross chicks about to fledge: windy with an average of 15 mph and lower temperatures, lower than the previous +80ish degrees we sweat on! In my last post, I asked you to guess our grand total Albatross chicks count and here it is: Laysan 20,922 and Black-footed (BFAL): 1,669 nests. Overall, the number of Laysan albatross chicks are increasing but there is concern that the Black-footed albatross are not. More chicks are fully feathered everyday and hop and flap their wings more vigorously than ever, eager to fly and leave our island for a multi-year trip over the ocean. We spotted our first BFAL taking off from the beach to the grand ocean! Last Friday, we completed our first monthly Christmas Shearwater (CHSH) survey. It included banding and collection of spew. CHSH is a nocturnal medium-sized dark brown shearwater that nest on remote islands in the tropical and subtropical Pacific Ocean. CHSH nest on the ground surface under dense vegetation and primarily our native naupaka shrubs. We captured adults at night with a pole net, walking one circuit along the perimeters of the runway, within a window of 3 hours. Little disturbance rules, everything has to be methodical and fast. At the end, few words were exchanged as our energy went down after a very long day of worthy work! We just completed the full treatment of the island and that is a big HOURRA!! We clearly noticed a decrease in invasive plant recruitment which consequently lessened our time to spray in the field and so our daily consumption of herbicide. That was a blessing for the overall load carried each day! With minimal rain, it is the peak season for native plants which are accustomed to growing in dry conditions. The landscape is now mostly filled with Alena, ‘Ena’Ena, Nohu, and Kawelu. The Naupaka, our native shrub, arbors a ribbon of white flowers and is growing vigorously. Fields of Sweet Alyssum and other invasive grasses are dying, leaving behind a crispy and unstable ground for burrowing seabirds. The nursery is in full swing, nurturing seeds and seedlings, from native species to Hawaii. We recently seeded Ma’o, A’ali’i, and Naio in hopes that these species would fulfill a niche on the island and provide more resilience to native plants. Some seedlings are starting to come out and that is exciting!! We thrive to provide more habitat for species of concern such as the BFAL, the Grey-back tern, and the Laysan ducks. 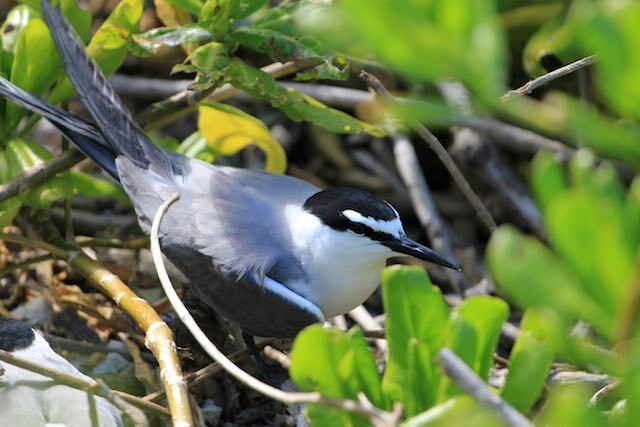 In so doing, we outplanted about thirty Naupaka on the Runway where the Grey-Back terns tend to nest underneath. We also created a corridor made of 48 native Morning glory, from a seep to an open area filled with dying Sweet Alyssum. This should create some shade and water refuge for the Laysan ducks and their ducklings. We covered the outplantings with crates (repurposed marine debris!) which provided protection to the sun and to the birds. Because water is a critical resource during summer, we focus more on seed collection and hand sowing. Our last innovation is to outplant a mature plant with seeds sprinkled around, the Lepturus seeds providing also some kind of mulch. So when we water the plants, we create a bomb of new opportunities and successful results. We also tend to choose an elevated location so when the plants will be established, seeds will disperse rapidly to other areas. ← A hot tub bolus-an machine!